Stuff Points: Earn 36 points when you buy this stuff. A beautiful looking way to deal with unwanted odors in your home, this decorative lamp also doubles as a fragrance diffuser. Just flip the switch to add colorful light to any room, and the glass dish at the top will allow you to heat oil or wax at the same time. As the attractive mosaic results in vibrant blue illumination throughout the room, you'll also be covering unwanted odors with the fragrance of your choice. Ditch the wet sprays filled with harsh chemicals, and deodorize your home with this safe and natural alternative. It comes complete with a long lasting halogen bulb, and it operates on electricity, so just plug it in to any standard outlet to complete the setup process. This model features a sturdy, tabletop design, and although it's rather large, the nine by seven overall sizing does allow for easy placement on tables and shelves throughout your home. The heavy base is made from darkly colored, solid wood, and the lamp on top has a large glass globe with a halogen bulb at the center. 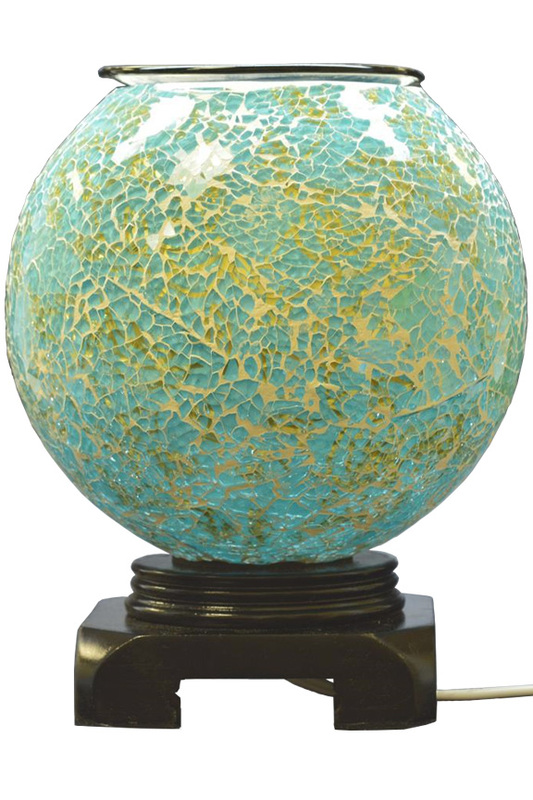 To give it an elegant look, a variety of shapes, sizes and shades of colorful blue glass create a mosaic on the exterior of the globe. It looks nice even when the light is off, but when you turn it on, the warm glow will illuminate the blue mosaic to make it shine with colorful light. Add a single essential oil or regular fragrance oil to the glass dish at the top, and as it heats, the fragrance will diffuse into the air. Use a mixture of oils to create a unique scent, or use a scented wax tart to avoid the oil, but get the same effect. Electric Power - Just plug it in to power it up, and you'll benefit from simple operation and even heat levels. Never worry about failure without notice, or flames that don't last. This model offers consistent, long lasting performance when compared to other options. Safe Deodorizer - No dangerous chemicals or flammable sprays to worry about, and no toxic residues to linger on surfaces throughout your home. This lamp and diffuser offers a safe and natural way to control odors in your home. 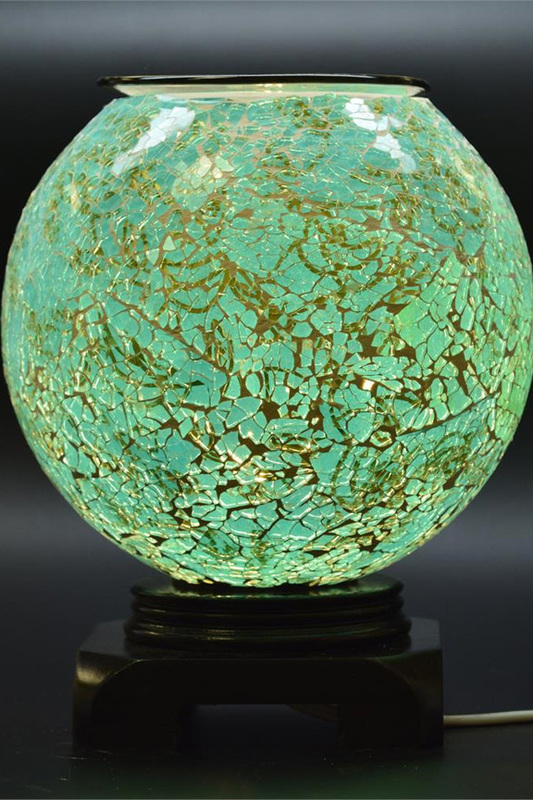 High Quality - A solid wood base and thick glass globe pair to create a top quality decorative lamp that also works efficiently as a fragrance diffuser. Thanks to superior electronics at the core, you can count on long term use without any trouble. Adjustable Heat - The dimmer switch allows for a wide range of options when it comes to setting the light and heat intensity. Turn it up to make it bright while increasing fragrance diffusion, or turn it down to create a more subtle effect. Simple Maintenance - The included blub will last a long time, but when it wears, you can easily replace it thanks to the design of this lamp. With a separate dish to hold the oil, simply hand wash or place it in the dishwasher when it gets dirty. Versatile Design - Doubles as a nightlight or decorative lamp and a fragrance diffuser or oil warmer. Smoke-Free - Nothing to set on fire, and nothing to burn, so there is no smoke or pollution as a result. When compared to candles and incense, this is a much cleaner option when deodorizing your home. Dimensions 7" x 7" x 9"
Uses Use to decorate will colorful light, or use to eliminate unwanted odors the natural way. Controllable Yes. A rotating switch allows you to set the exact temp and light intensity that you want. 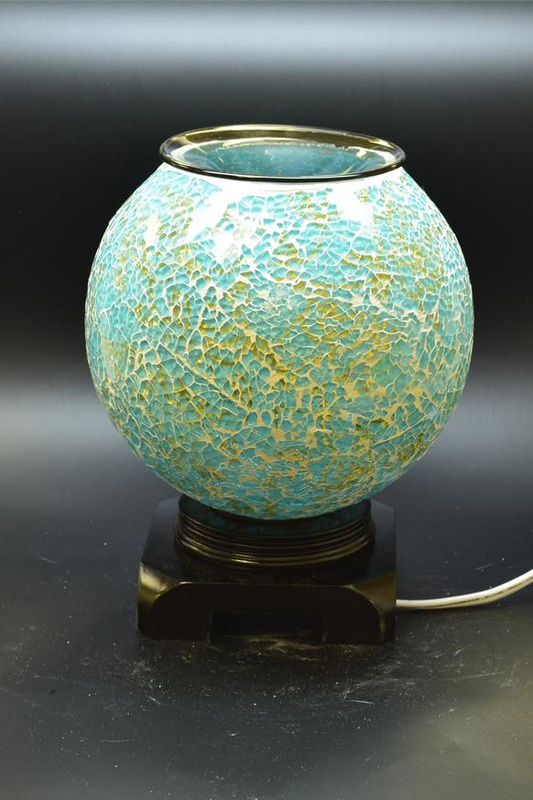 Heat scented wax or fragrance oils atop this elegant lamp to visually improve any room while adding your favorite fragrance to the air. Order Yours Today!